The beets can be prepared up to 1 day ahead. 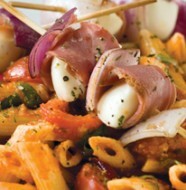 The salad can be prepared 1 day ahead, covered, and refrigerated. 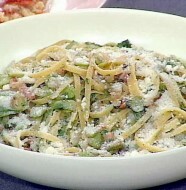 Garnish with the cheese and nuts just before serving. 1. 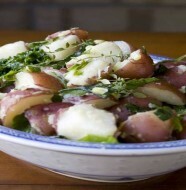 To make the dressing, in a medium bowl, whisk the balsamic and cider vinegars, sugar, salt, and pepper. Gradually whisk in the oil. Cover and set aside at room temperature. 2. Preheat the oven to 400°F. If the beets have their greens attached, trim the greens, leaving about 1-inch of the stems attached to the beets. Scrub the beets under cold running water. Wrap each beet in aluminum foil and place on a baking sheet. Bake until the beets are tender when pierced with a long, sharp knife, about 1 ½ hours depending on the size of the beets. Cool completely, without unwrapping the beets. 3. Unwrap and peel the beets. Cut into ¾-inch cubes. Place in self-sealing plastic bag and refrigerate until chilled, at least 2 hours. 4. 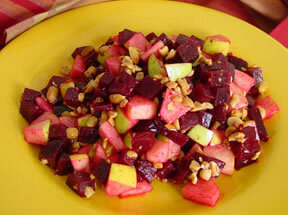 In a large bowl, toss the beets and apples with the dressing. (The salad, at this point, can be stored up to 1 day.) Place a lettuce leaf on each plate, and spoon the salad onto the lettuce. Top each salad with the cheese and walnuts. Serve chilled. Road Test Results: I sort of followed these directions. I sort of ignored them, too. I roasted the beets in foil, which does produce fantastic results. However, check your beets after about 45-minutes. Tender is one thing, over-cooked beet jelly is another. I didn’t cool the beets as suggested. I didn’t have time. They sat in foil in the refrigerator until I was ready for them, and then I peeled and diced them and tossed the salad ingredients together, dressing, cheese, nuts, and all. I used walnuts which I roasted a little in a pan, if only to crisp them up. I didn’t use red lettuce leaves, though I understand where Rodgers is headed, that nice composed look. I didn’t have the leaves, and I didn’t have time to screw around with composition. I had a miserable cold, and I had to get Thanksgiving dinner on the table. So this apple and beet salad, for the few of us interested at the table, was served as a side dish, something of a cross between salad and vegetable. It was the one dish I could taste – that crisp blast of vinegar – and I loved it. I found the leftovers about a week later, tucked into the back of the refrigerator on the bottom shelf. I could taste by then, and the flavors of the salad had had ample time to marry. Simply delicious.